Aculon’s range of oleophobic coating treatments bond oil-repelling layers of nanoscale thickness to many different kinds of surfaces. Easy to apply and requiring no expensive capital equipment, your component or product can benefit from the added value and improved performance characteristics of oleophobicity and hydrophobicity. Aculon® patented oleophobic surface treatments come into their own in environments and conditions characterized by frequent contact with human hands and fingers (such as smart phones or other personal electronic devices), or where there are high concentrations of oily residues and grimy deposits. Most surfaces which are subject to these conditions become very dirty, very quickly and they are usually notoriously difficult to clean and prone to smudging without using detergents or solvents that are invariably aggressive and often rather toxic. Aculon® coating is able to reduce adhesion of oils to these surfaces, allowing for easier cleaning. Aculon’s range of oleophobic coatings bond oil repelling layers of nanoscale thickness to many different kinds of surfaces, which imparts them with easy clean and anti-smudge properties. In addition, all of Aculon® oleophobic treatments have the advantage of being hydrophobic as well. The oil repellent coatings are very easy to apply requiring no expensive capital equipment. If your component or product can benefit from the added value and improved performance characteristic of oleophobicity, then one of the Aculon® oleophobic surface coating treatments can indeed help you meet your objectives. The Aculon® treatments result in a functionalized surface that is highly oleophobic. 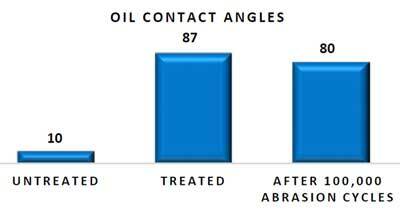 As can be seen from the graph below a treated parts is 8 times more oil repellent than an untreated part where oil would easily wick across the surface. 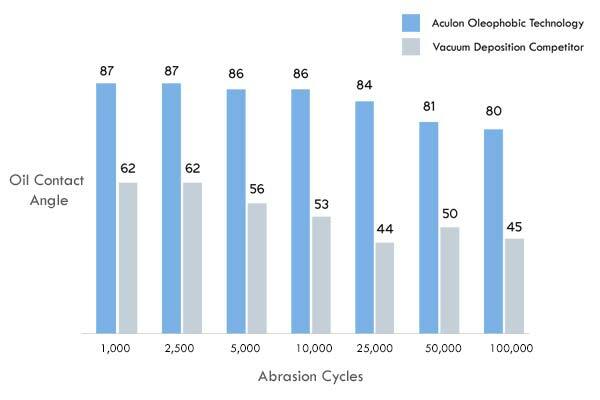 Independent testing has proven that Aculon® oleophobic coating treatments and coatings are highly durable maintaining nearly the same level of oil repepllency even after 100,000 abrasion cycles. Independent testing proves that Aculon® oleophobic technology offers best in class durable performance. The ability of a an Aculon® functionalized oleophobic part far outperforms the initial performance of all competitive materials. The NanoClear® ability to repel oils & solvents is maintained for over 100,000 abrasion cycles after treatment while the performance of a well known vacuum applied competitive materials performance quickly falls off after 5000 abrasion cycles from an already weak barely oleophobic starting point. Aculon’s oleophobic treatments are compatible with the following types of materials. Click through to see whether your specific substrate is compatible with the technology.